According to various sources and an independent view yesterday on Grafix Avenger, the Ruben Ramos camp and its backers intend to see some payback for what they feel are numerous violations by their Old Guard opponents backing the Raia-Mason slate. The rumored TV ad has been obtained from a MSV reader and is published for your consideration. 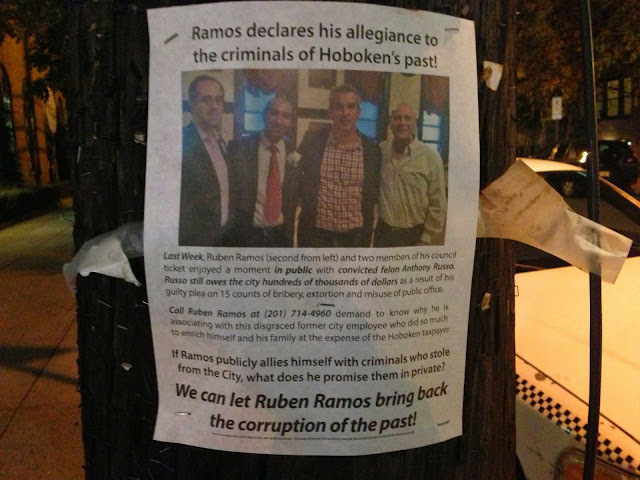 Coming on the backs of the flyer (now gone from many locations) appearing earlier this week attacking Ruben Ramos and his council ticket for consorting with known criminals - in this case it was felon and ex-mayor Anthony Russo - the blood is only going to be drawn further. to continue after the election. This FinBoy production puts a bullseye not only on his back but Beth Mason's, his sponsor. Talking Ed Note: This is a hard hitting ad from the Bet Mazin One Hoboken Team. That's why I'm voting for Bet Mazin. That's an inside joke from 2009 when a positive ad was featured by Beth Mason for Beth Mason pushing this same One Hoboken theme. The public was not fooled however, and saw it as Mason selling out to the Russo clan. Based on the council records since, they weren't wrong. Some are suggesting that unholy alliance will end and oddly it will be the family infamous for being on the grift making that decision. MSV can't conclude on the matter so let's see what happens. First there's an election for the soul of Hoboken Tuesday, November 5th.